In this page, we present a chronological timeline as a guideline of tasks to be performed in the first few years of life. This timeline can help the families have an idea of what to do and at what age. Importantly, this timeline can and sometimes requires to be adjusted to the needs and characteristics of each patient. 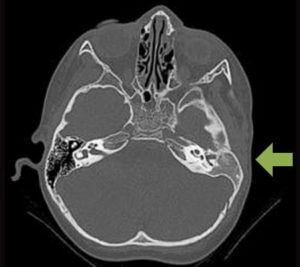 Temporal CT scan to evaluate for potential atresia repair and rule out a cholesteatoma (1 mm cuts or less with bone windows, usually in a manipulable voxel format without contrast). In-Office or skype consultation with Dr. Reinisch or Dr. Tahiri and Dr. Roberson. Dr. Roberson will read the CT scan and determine if the patient is a candidate for Atresia repair. If a Medpor Ear reconstruction is elected, it can be performed as early as 3-3.5 years of age. It can be performed with Atresia repair in the form of a Combined Atresia Microtia (CAM) repair or those procedures can be performed separately.